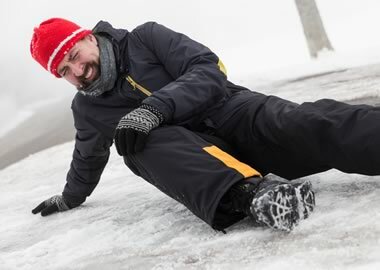 At Mueskes Landscape and Snow Management we are more than a snow removal company – we help reduce your risk and liability. Not all snow management companies are equal. Professional snow and ice management requires a high degree of attention to detail. Many companies require high levels of insurance for their snow contractor because of the inherent risk involved. How do we help to reduce liability during snow events? We get storm alerts prior to and during the snow event. We conduct site visits and maintain phone and email contact with customers to provide updates. Photos and videos are taken during the pre-season walk-thru and we develop a site plan for all customers to document where snow will be piled, where all egresses, fire hydrants and drains are located. We implement CrewTracker Software ®, which allows paperless documentation of date and time of all services provided and by which crew member. Customers have access to the CrewTracker Portal, which allows real-time updates of services being provided at their locations and photos documenting the site before, during and after service. Our fleet is outfitted with GPS to track exactly where crews are located, and record where they provided services. This is especially helpful for tracking salt applications. Crew members are provided high visibility gear and safety equipment for use while on site. We are continually training and educating crew members with the latest techniques and standards of the snow industry. Our insurance, geared towards snow contractors, exceeds the requirements of many customers and we maintain the highest levels necessary. Bottom line…We take this stuff seriously. Snow preparation is a year-round project that we always strive to improve. You can rest assured that we are not only prepared for the storm, but everything is documented in the event of a later claim.